My Austin gallery contains several iconic architectural locations in the Austin Texas area. Locations include The Austin skyline, Pennybacker Bridge, Stevie Ray Vaughan's Memorial statue, Pfluger Pedestrian bridge, Texas State Capitol building, Moore's crossing bridge, The Boardwalk at Lady Bird Lake, various urban landscapes, etc. Texas Capitol with blooming yucca. 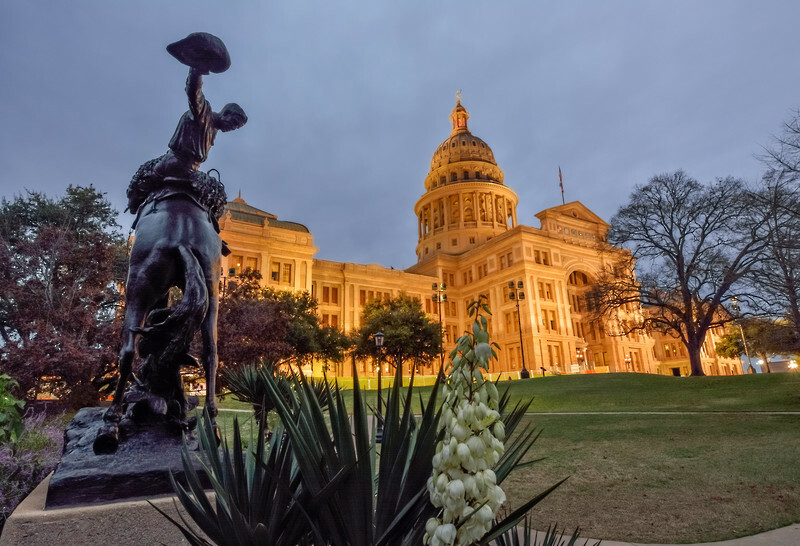 From the south grounds area of the Texas State Capitol, this image displays a bronze Texas Cowboy Monument with a blooming yucca by its side.